Piloted in 2012, Fifth Third Bank identified mortgage customers who were behind in their payments due to job loss and offered to help them land a new job with outplacement firm NextJob’s comprehensive job search program. After 6 months, nearly 40% had landed jobs. The program expanded in 2013 and this year’s effort will attempt to share actual job seekers’ stories via video vignettes via social media in a cause marketing campaign called ‘Reemployment‘. For every 53 retweets, Fifth Third will fund a job searching coaching package for another unemployed person. 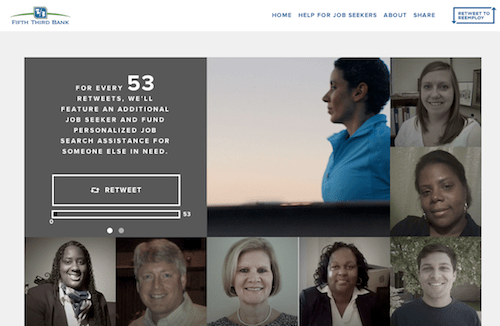 To date, 43 additional job seekers have been helped with 2279 retweets. This cause marketing campaign offers an excellent example of how social media can be used for good. In an era where mistrust of financial institutions is high, Fifth Third astutely identified the root cause of mortgage default among its own customer base – unemployment – and then provided meaningful assistance to help customers get back on their feet. Using social media to share authentic stories of real people in need of work (instead of promoting the bank’s own agenda) is highly effective and eminently shareable. Importantly, the social media effort and carrot to provide additional job coaching packages for retweets is layered on top of an existing foundation of support from the bank. Using this model, the bank shows the good that’s already being done and asks for help in sharing stories as well as assisting additional job seekers.